& I’m deciding getting this post out of my brain & into the screen of my iPod is v important. This post is really important to me because it’s the result of what life’s been throwing at me recently. A while back I started practicing yoga via YouTube; admittedly, half the things I thought were yoga I have come to learn actually aren’t… So I was loosely practicing yoga. I started because I was going through things that made me question who I am. I mean really question who I am. I was losing faith in my core values that I had worked so hard to discover. I didn’t know how to disconnect from my anxiety. I was losing a battle to negativity, & I was losing pretty fast. I needed to do something. Backpedal a few years & you’ve got the time when I started lifting weights. It was a similar situation, but my anxiety this time was coming from body image issuezzz. I was trying to learn how to be healthy & fit.. I decided to try a 4 week weight training program. I loved it, saw results, & have grown into my own style of lifting since then..
Yoga has literally changed every aspect of my life…I know it sounds cliche but it’s true. What I’m realising now is how much it’s impacted my lifting. There’s a lot to gain from a body-mind-soul approach to fitness. Mental Strength: In my experience, exercise of any kind is more of a mental battle than a physical one. My body can ingest some food or caffeine & be easily tricked into feeling ready for my workout. My mind, however, takes more effort. Practicing yoga has srsly transformed the way my brain thinks about me. I don’t have as hard of a time getting through self-doubt, or convincing myself that I am worth that hour and a half in the weight room, or that it’s okay if I’m not lifting as much weight as other people. I’m totally cool with feeling awkward at the gym, & that feels like a really big accomplishment. Knowing My Limits: No ego lifting! I am able to recognise when I’ve done enough. I can feel in my body & mind when I shouldn’t go further. Being in touch with my body has allowed me to get to this point. Yea I’ll try something & fail with flying colors, but I’m not trying something I know I cannot do with the fullest effort. If I’m not there, I’m not there- simple as that. 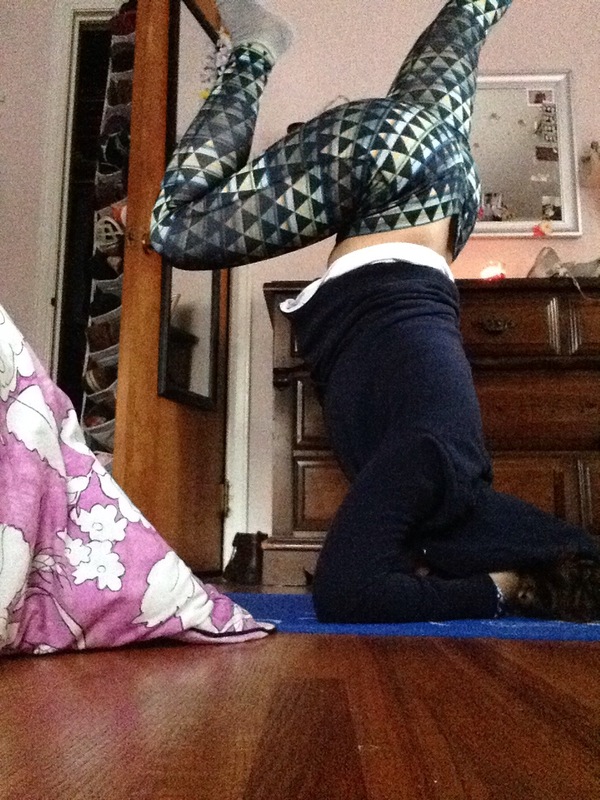 Appreciation: I would vote that this as the most powerful benefit I’ve experienced from my yoga practice. I don’t measure progress by how I look anymore… If I can do a single extra rep I feel accomplished. If I work through my own self doubt, I feel accomplished. If I try to lift a new weight but fail, I know there was a time when I couldn’t even do the basic lift itself. I enjoy the smaller steps in my journey. I’m way less critical of myself. I don’t obsess over skipping a day at the gym, because I recognise the importance of taking care of my body. I’m thankful for myself & all that I’ve been through. So there ya have it- my personal experience as what appears to be two conflicting identities. Before my own journey I never really pictured lifting weights to have any connection to yoga. Zen meatheads? Um…..???? But as it turns out, the health of your body & mind are extremely connected. The love my yoga practice has shown to my physical exercise is the most clear example of this connection. I hope yall enjoyed this little exploration of my journey to mind-body-soul health!! Okay, this might seem like a strange angle to take when looking at exercise… But since starting this blog & my loosely defined ‘fitstagram’ I’ve been realizing the influence of the outside world on my own health choices. Which brings me to my point: why are we so caught up in these cookie-cutter ideas of what ‘good’ exercise looks like? Exercise can be anything you enjoy that gets your body in motion. It doesn’t need to be exactly 5.3 hours of cardio a week, with 3.6 hours of weight training, plus 17.24 hours of yoga, minus 30 minutes of cardio for every salad you eat, minus 20 minutes of weight training for every pound you lose. Health is not a math problem!!! Feeling good should be the determinative factor in our decisions regarding exercise. This is not to say you shouldn’t include both cardio & weight training (& yoga!!) in a balanced exercise routine.. I’m in love with weight lifting & dread cardio, but I’ve found movements I enjoy that get my heart goin. I roller blade more than I run, I do jumping lunges more than I pedal an elliptical, I dance like a wild woman more than I ride a bike… I’m still achieving the main goal (incorporating cardiovascular exercise), but I’m doing it in a way I like. I think it’s really important to give attention to the fact that we shouldn’t do things because we think we have to. Do things because you want to. Step out of the box, or better yet- jump on & around the box! This will definitely make for a happier, healthier, more empowered you!! Get out there & move! Squatting is an exercise that, if done right, can do amazing things for your body. It can increase your muscle strength relatively quickly, get your heart in shape (aka it is cardio-based), & increase your body’s fat burning skills to keep ya hungry. Squats are perfect for any fitness goal…. I may be slightly biased because I love squats, but not really because full body exercises (like squats) are thebomb.com. Squatting is primarily a leg/booty exercise, but there’s much more to it! Quads: The general motion of a squat requires your quads to control your knee extension. The upward motion means these muscles push your body back to the start position. Hamstrings: Your hamstrings help your quads with hip extension while doing squats. The stronger/more flexible your hamstrings are, the deeper you can get in your squat! More work is required from the hamstrings when you’re able to lower your upper thigh below parallel to the floor. Core: You rely significantly on your core muscles (front & back) while performing this exercise. Using your core muscles to keep your upper body in a stable position throughout the up & down motions strengthens your back & abdomen. It’s also superb for your posture! Upper Back/Shoulders: These muscle groups are utilized more when weight is added. However, with or without weights, your back & shoulders are engaged when you perform a squat. That means they’re working & getting stronger with every rep! When you’re getting started, the most important thing is squatting safely. I chose this exercise as my first how-to because personally I did them wrong for quite some time…I had poor form, which I currently feel in my knees if my squats get sloppy. Hopefully you can avoid that because it’s not much fun. 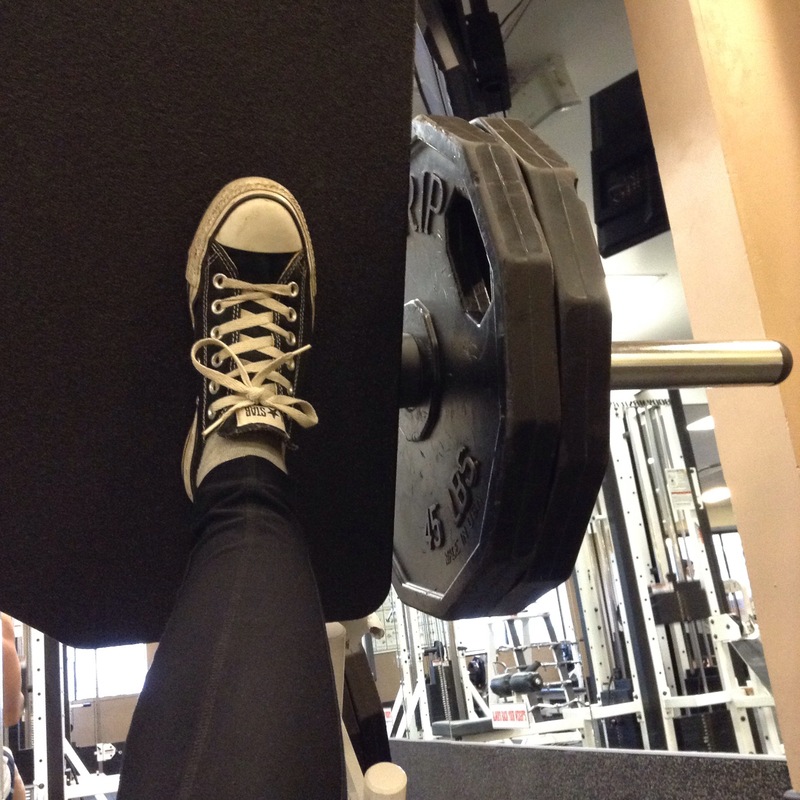 Squats are also one of three ~power lifts~ that utilize most of your body & help you gain strength. I did this without weights (body weight squats) so you can see where my legs are going in relation to my ankles/toes, my back positioning, & basically just unobstructed form. 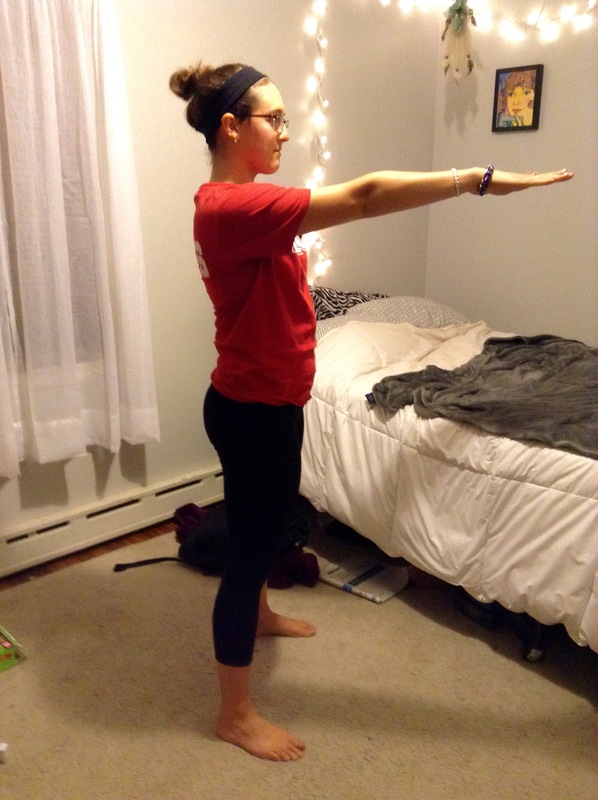 Start Position: Place your feet shoulder-width apart (or wider if that feels better). If your hips/hamstrings are tight, you may want to turn your feet out slightly. Keep your back in a neutral upright position with your chest open. End Position: You want your upper thighs to be parallel (or close to parallel) with the floor. Your knees should be in line with your ankles, not going beyond your toes. After one squat, your backside will grow to never-before-seen proportions!!!! WOW, just ONE squat!?!1?!1? So, there you have it- a fool proof guide to squats! (jk) But adding squats to your regular exercise routine is definitely a good starting point for building strength & power. You’ll find that there are infinite variations, all working your muscles in slightly different ways. Have fun with your workouts, get creative!